Hiring a company to clean your rugs can be difficult and confusing. With the growing popularity of oriental rugs, it seems every carpet cleaner claims to be a specialist. The truth is there are very few cleaning plants equipped to handle your rugs properly. Reilly’s Rug & Carpet Cleaning is one of New Jerseys oldest cleaning plants, operating since 1918. Our experience and process are what sets us apart. With knowledge of the age old techniques of weaving and repairing rugs to the latest changes in the cleaning industry, our experienced staff can assure you quality workmanship. Learn more about us here. If you have noticed a rug stain or tear and are not certain what you can do about it, rest assured that our team at Reilly’s Rug & Carpet Cleaning can help. 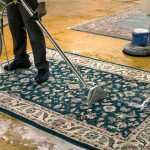 We offer professional rug stain removal and a number of repair services that can bring life to even the most aged looking rugs, and we are ready to begin working for you. Area rugs can develop many issues over time with regular use, and these issues can result in the unfortunate decline of the condition of your rug. This can turn a gorgeous accent in your home into an eyesore, but rest assured that there is a solution available through our professional repair services. Reilly’s Rug provides wall-to-wall carpet cleaning services to have your floors looking like new. Call us today for details.